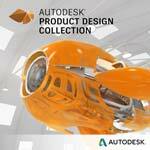 Create products using the latest design and engineering tools, including Inventor Professional and AutoCAD. The Product Design Collection offers connected, professional-grade tools that help you make great products today and compete in the changing manufacturing landscape of the future. Mechnical designers can design, test, and manufacture products by using a rich collection of connected 2D, 3D, and cloud-based engineering and design tools. Electrical designers can associatively connect 2D schematic data to their 3D model counterparts. An electro-mechanical workflow speeds the design process and helps reduce the likelihood of design errors. Factory designers can convert factory layouts that were designed and optimized in AutoCAD into rich 3D models. Combine them with point cloud data to create a complete digital factory for review. Inventor Professional mechanical design and 3D CAD software offers professional-grade 3D mechanical design, documentation, and product simulation tools. AutoCAD is the premier tool for architects and design engineers, with advanced design and documentation tools, customizable workflows, and powerful 3D modeling and collaboration. Other components include AutoCAD Electrical, AutoCAD Mechanical, AutoCAD 360 Pro, AutoCAD Architecture, 3DS Max, Factory Design Utilities, 25GB of cloud storage, and more.